As anyone who was there can attest, the melding of dance floor rhythms and beats with rock ‘n’ roll snide and sneer was one of the most exciting musical developments of the 2000s. Sure, rocking and raving had met before – look no further than The Prodigy and the late 90s explosion of big beat music – but rarely had they done so in such an all-encompassing, innovative way. Whether it was referred to as electroclash or the bloghouse movement that followed in its wake, the genre was real and it was everything. Post-punk was allowed, techno was welcome, and disco was all but worshipped; it was everything happening at once, and as such cacophonies of sound tend to do, it drove people crazy. Fortunately, it still does. This weekend, Miamians will have the opportunity to throw down themselves when Danish trio WhoMadeWho stops by Historic Virginia Key Beach Park for their performance at House of Creatives Music Festival. The Copenhagen-based band, consisting of Jeppe Kjellberg, Tomas Barfodand Tomas Høffding, has been crafting their distinctive blend of club-ready rock music for the better part of a decade and a half, notching accolades, a healthy fanbase, as well as a considerable number of respected collaborators and remixers along the way. 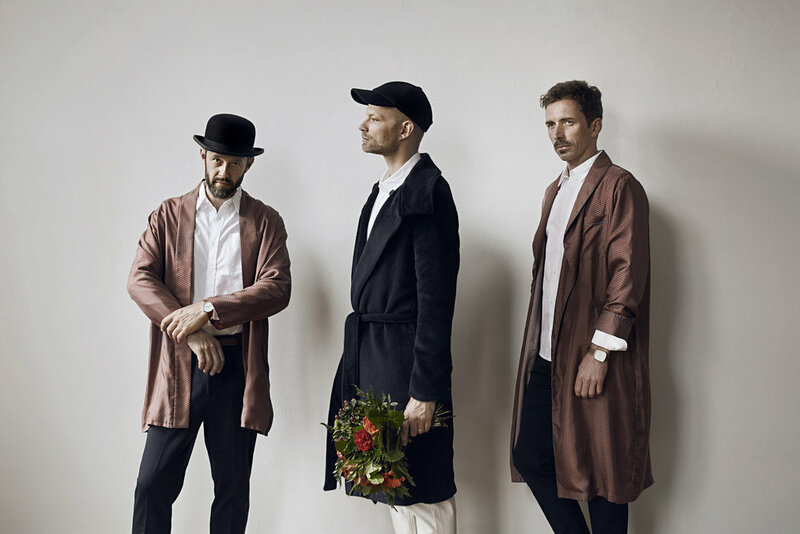 In advance of WhoMadeWho’s performance tomorrow night, members Tomas Høffding and Tomas Barfodand spoke to City Gazettes about the band’s last performance in Miami, what listeners can expect from the band’s impending record, and their thoughts on the ongoing legacy of dance-punk and their own work. City Gazettes: You guys recently released your first singles, “I Don’t Know” and “Dynasty” for your upcoming LP, Through the Walls. What motivated your decision to lead with these singles, and what do they signal for your forthcoming album? Tomas Høffding: Well we really wanted to show the world that we are going some new directions on this upcoming album. The “I Don’t Know” single is so radical that it hopefully shocked our old fans a bit, and got a lot of new fans exited. Our next single, “Dynasty,” is like a deep pop hook to the body; a left - right boxer attack I guess. The two singles showcase two important sides of the band; we like to be weird and dark, but we also like to celebrate love, life, and dance. CG: This weekend will see you guys perform in Miami for the first time since your 2015 outing at Grand Central, correct? Given the raucousness of the city and its nightlife, do you have any particular favorite Miami stories or anecdotes, whether from that night or over the years? TH: To be honest, I only remember two things: walking on the beach in the sunset hour, feeling the warm water on my feet, and dancing around in the sand like idiots in a corny slo-mo scene from some indie movie. And then I remember the gig, which was really banging; I hope we can keep the [same] level this time. CG: The band has been performing their blend of dance and rock sensibilities for a little over a decade now. Given the immense popularity and peak of that genre in the mid-2000s – with the likes of electroclash, dance-punk, DFA Records-styled stuff, etc. – how, if at all, do you think that time period has left its mark on contemporary music, whether that be in pop, dance music, or what-have-you? Tomas Barfodand: The most important thing for us was that ‘real’ instruments were making their way into the clubs. It was amazing to see the shift, where a lot of bands started doing more club-oriented music and where deejays started playing records by real humans. I remember when I first heard a !!! record, it blew my mind. There were a few commercial acts picking up the vibe, but in general, disco-punk, disco-electro or whatever, is still mostly an underground thing. CG: WhoMadeWho has been remixed by just about everyone, from crossover acts like Hot Chip, techno figurehead Seth Troxler, to headier artists like Michael Mayer and Kaspar Bjørke. How does it feel/has it been gratifying to have your work appreciated and reinterpreted across such a vast and respected musical spectrum? TH: All the love we get from these kinds of people is a crucial leg in the whole WhoMadeWho thing. We always took pride in being both in the indie and the techno / dance circuit. It’s fun to see how, when we release an album, on one side we have the radio singles that people sing along to at our live gigs… and then from the same album, another track is suddenly blowing up in the techno scene and become a worldwide anthem on the dance floors. We’ve seen it many times, from Maceo Plex remixing "Heads Above" or the Tale Of Us remix of "Every Minute Alone". We also have some huge remixes in the pipeline for “Dynasty,” with one of them having had a bootleg premier just a month ago on a livestream to millions from a Kølsch DJ gig in the Eiffel Tower. That said, we never know which tracks from an album will blow up… we’ll know more than a year from now. CG: Where does everybody in the band reside at the moment, and what, if any, local scenes have been motivating or grabbing your attention as of late? TH: All three of us live in Copenhagen. Even though there is a lot of nice stuff gong on these days in Copenhagen, it’s only 1 million souls, and we are mostly inspired by the global scene. CG: What can Miami audiences look forward to this weekend at House of Creatives? TH: The most clubby rock band they ever saw… and the most rock ‘n’ roll techno band they ever saw. Band members crawling on speakers; LOUD bass; reverse guitar playing; disco drum beats galore and deep distorted wormholes of sound taking you to other galaxies.